We have treated our 200th car…. Yippee!! It’s a known fact that cars with unpleasant odours not only take longer to sell but can reduce the value of a car. Our car technician David is trained in removing stubborn odours from cars and has lots of experience in this field, having recently treated his 200th car. What an achievement! 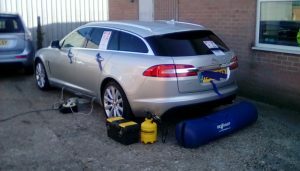 BioSweep’s ® unique technology can be used to permanently remove odours from cars in one quick treatment including; smoke odours, food odours, pet odours, bodily odours, fuel spill odours. We have even removed an odour from a car that was caused by a sour milk spill! To find out how BioSweep UK Ltd can help you today please give us a call 01243 697359 or request a quote here. Welcome to our new website and first blog post! BioSweep UK Ltd provides services in decontamination, including the removal of odours, bacteria, viruses, VOCs and fungal hyphae, long lasting anti-microbial treatments, mould remediation and air and surface sampling. BioSweep UK Ltd © 2017. Sign-up now to receive our newsletter and exclusive offers!